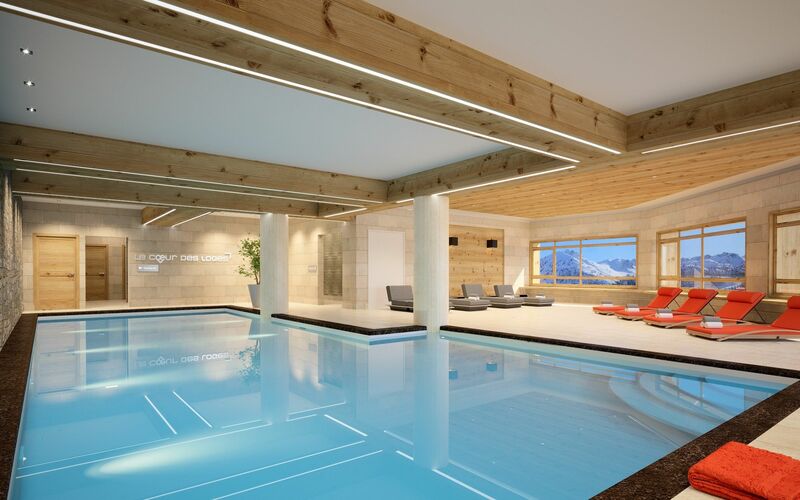 Alpine Charms - Les Menuires Ski in/ ski out Apartment Loges 3 bedrooms 6/8 (Plus apartment) with swimming pool, sauna and jacuzzi and spa. Self catered, restaurant and ski shop on site. 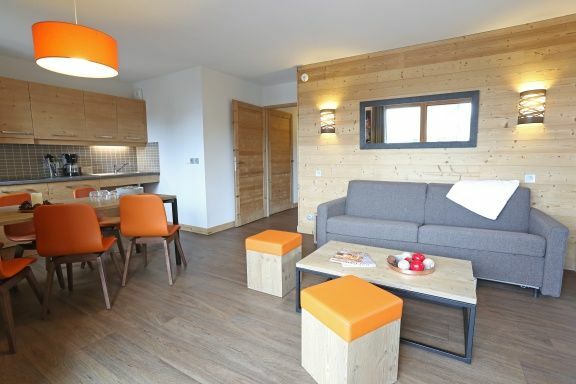 Les Menuires - Ski in / ski out modern 4 star, spacious 3 Bedroom apartment for 6/8 people . Situated at the entrance of Les Ménuires ski resort in the Preyerand area. Indoor heated swimming pool, jacuzzi, Spa. Restaurant on site with panoramic terrace with restaurant. 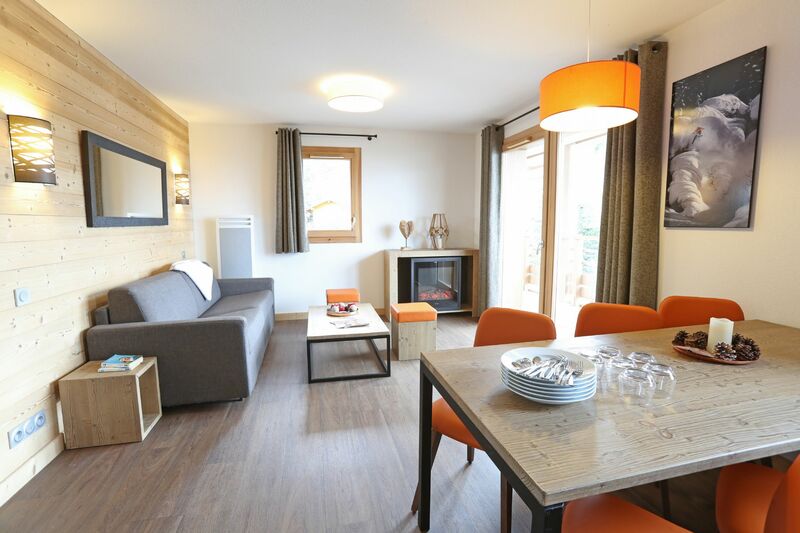 The 4 star Loges apartments were new for Winter 2016/7 and are situated at the entrance of the Les Ménuires ski resort - ski in / ski out - in the Preyerand area. They are attractive, modern apartments and benefit from a shared swimming pool with jacuzzi. Situated in the Preyerand area, step out of the ski room onto the Blue Bettex piste. From here it is a gentle ski down to either the Bettex chairlift or to the Tortollet chair lift, which lets you link in with the Croisette area. Alternatively you can ski down to the Rocher Noir lift which takes you up the other side of the Les Menuires valley. Ski back on the blue Bettex piste and end your day at back at the ski room! Complete beginners can get the ski bus up to the Croisette area for lessons. The apartments are easy to find, located just off the main road at the entrance to Les Menuires. There is a new "Carrefour" supermarket just by the apartments, a ski shop in the residence - book online in advance and get up to 50% off. The ski bus stop is outside the residence if you want to get the bus up to the Croisette area. There is a restaurant in the residence which also has a take away menu, as well as a selection of other restaurants within easy walking distance (Le Chalet, La Ruade, le Table des Marmottes). (from 4 to -13 years old) or you can order your bread and pastries at the reception. The onsite restaurant has a panoramic terrace for lunches and dinners with a view of the ski area. There is an indoor heated swimming pool with jacuzzi, as well as a separate Spa with jacuzzi, steam room/sauna and relaxation area. Access to the swimming pool is unlimited during opening hours. The spa relaxation area offers your first visit free (must be booked at reception) and then additional entrances are charged. Treatments can also be booked at the spa. The apartments were new for winter 2016/7 and are comfortably and stylishly furnished. The residence has a welcoming reception area with log fire. Built in wood and stone, the residence has elegant architecture which blends in perfectly with the local style and also has a superb panoramic terrace. 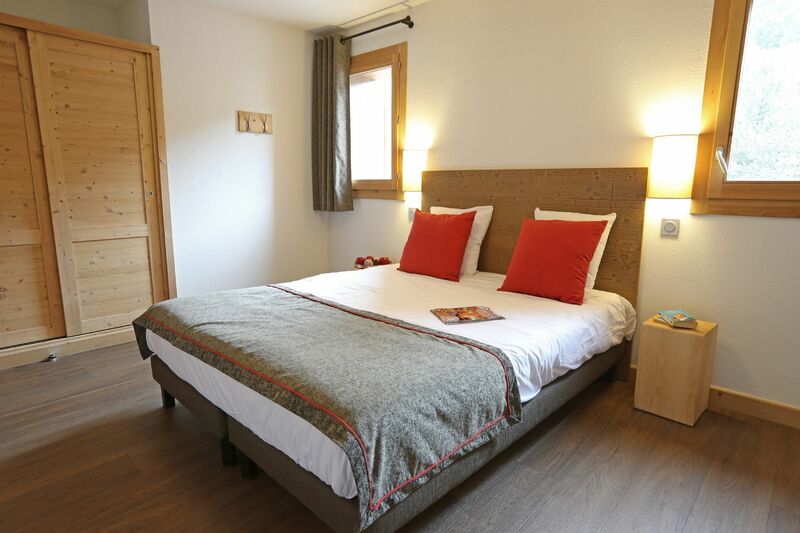 It offers spacious, well equipped apartments and beautiful reception areas for when you come back from skiing or for evenings with friends. Qualified and Professional organisers. All the season, from Monday to Friday, 9am-12pm or 2pm-5pm. Pre-booking is mandatory, dependent on availability. Throughout the week, teenagers take on crazy and fun challenges, until the award ceremony at the end of the week. They also have access to the Squ@t, the connected area exclusively for 11-17 y.o, with couches, consoles and other games! Baby kits (under 2 years of age) : Includes: baby bed, high hair, changing mat, potty, bath chair (subject to availability, booking compulsory). Delivery in the morning of fresh bread and croissants at the reception desk. To book the previous day, payment at the front desk after delivery. Restaurant partner with panoramic terrace for lunches and dinners with a view of the ski area. of your apartment, on the day of your arrival ! Deliveries on Saturday for an order placed before previous Monday. Indoor heated pool - Free entry during the opening hours (closed on Saturday) . Not supervised. Children are under the care of the parents.